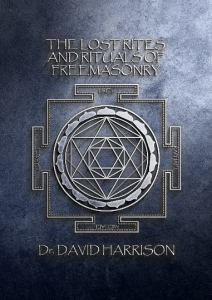 My new book The Lost Rites and Rituals of Freemasonry is on course for publication with Lewis Masonic at the end of the summer and it’s a book that I’ve very much enjoyed researching and writing. The book has six chapters, it’s around 50,000 words and will have around 40 plus images. The foreword is written by renowned Masonic historian Art de Hoyos and peer reviewed by John Belton. Both are members of Quatuor Coronati Lodge, the leading Masonic research lodge. I’ve also played a major role in the development of the cover design, and I found myself experimenting with symbols, sigils and geometrical designs influenced by some of the lost rites themselves. 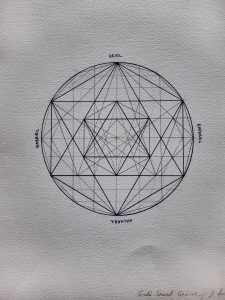 My first design included a variety of geometrical symbols such as the hexagram which was used by Fratres Lucis for example, and I also wanted it to incorporate other symbols within the geometrical structure, along with the four Arch-Angels Uriel, Raphael, Michael and Gabriel who are mentioned in various rituals discussed in the book and are also used in protection rituals. As I continued to experiment with cover ideas my sketches became more extended to reflect themes such as meditation and I introduced some of the lost archaic symbols mentioned in the book. It was only after being reined in by the graphic designer that they were discarded in favour of the very first design, the finished cover utilising a yantra element to represent the theme of meditation – something that was referred to in Cagliostro’s Egyptian Rite. So the cover is decided upon – for now – as publishers can always change their minds at the eleventh hour on such things as design. But for now, it stays. I’m giving away the signed sketches with pre-orders of the book.